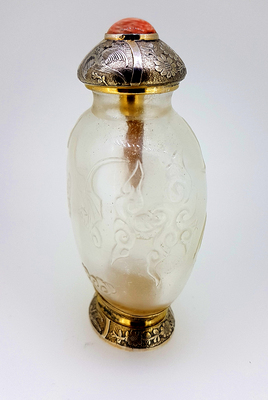 Item description: * A Qing dynasty carved in relief rock crystal snuff bottle. 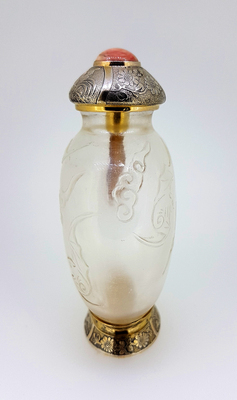 Probably Chinese Imperial Palace workshops, 1790-1850 with later 1895-1910 French silver settings in the Art Nouveau Chinois fashion. 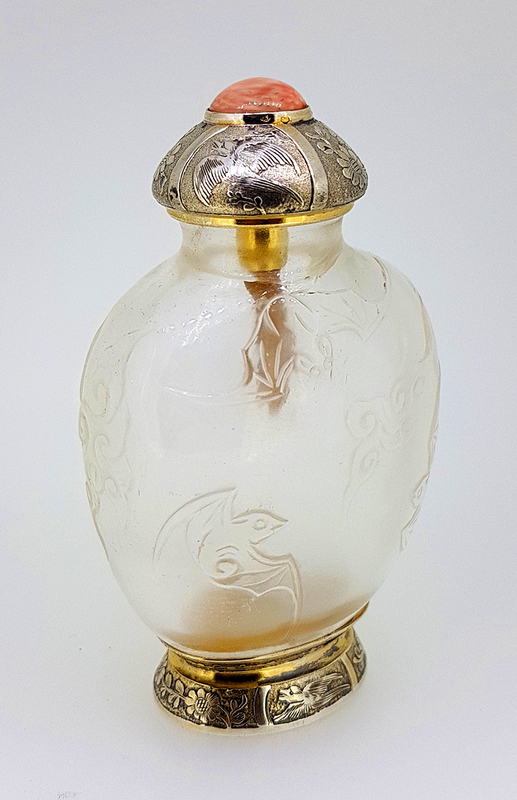 The bottle is very well-hollowed of compressed oval form and crafted out of a flawless and transparent piece of rock crystal. 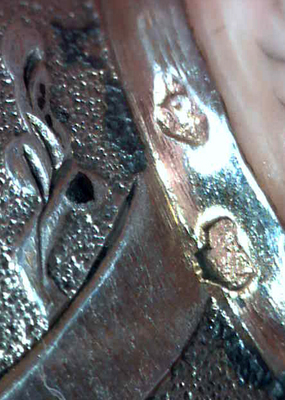 The carvings are incised on each side and depict 5 flying bats flying among stylized cloud like patterns. 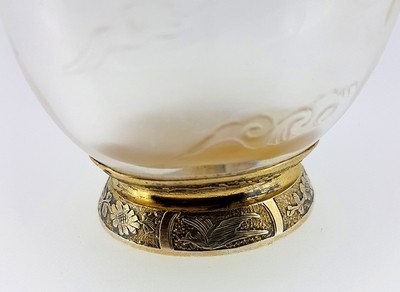 The French silver base and stopper are fully hand engraved with blossoming flowers and birds of paradise. 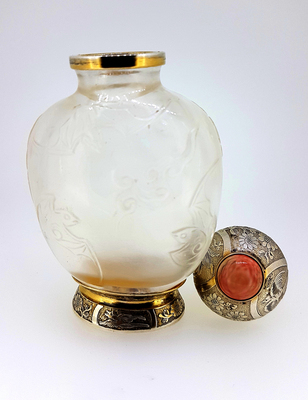 The stopper with a pink coral cabochon attached atop. 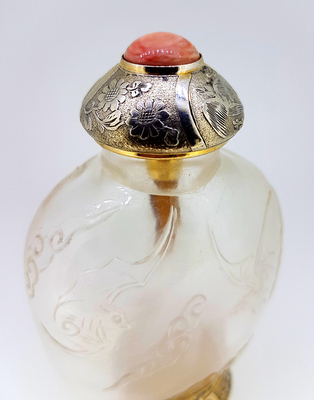 There is also a silver gilt collar around the bottle’s neck. 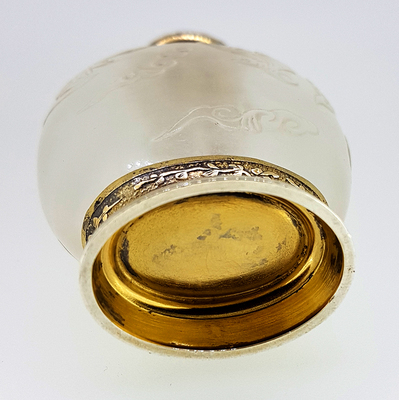 All silver parts are hallmarked with French silver hallmarks, as well as partial maker’s marks starting with a capital initial “P”. 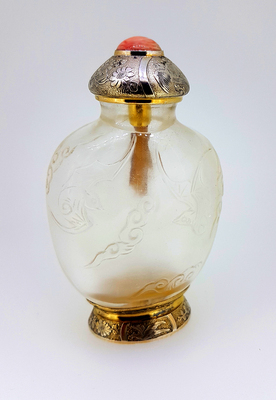 The bottle stands 8.3cm (3.27”) tall with cap (7cm / 2.76” without cap) and is 5cm (about 2”) wide and 3.3cm (1.3”) deep. Gross weight is 96.6 grams. Perfect condition. 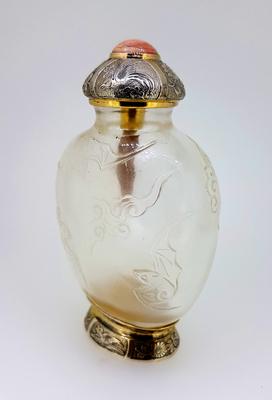 Provenance: Former collection of a known European aristocratic family. 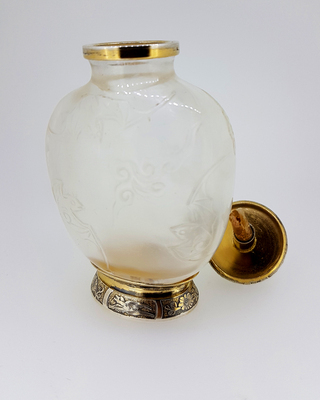 Absolutely scarce antique Chinese collector piece and one of the important and rare antique China carved rock crystal snuff bottles and works of art. Chinese admiration for bats began thousands of years before Christ. Sometimes people view the Oriental world as an interplay between active and passive forces (male and female). Bats were thought to embody the male principle while the flowers and fruits are the female. In feng shui applications, bat is used as a wealth cure and considered a symbol of wealth. 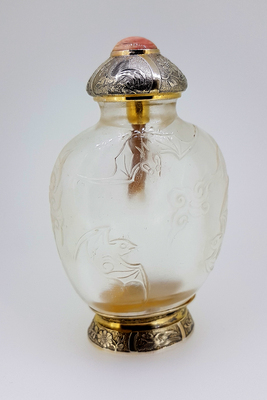 Bats also came to represent longevity and happiness, so it is an auspicious symbol in Chinese culture. Bats are believed to have highly developed sensory parts for "smelling" out places with auspicious chi energy. The next time these flying creatures come and nest in someone’s house, one should rejoice because that heralds good fortune. The bat is a symbol of happiness and joy. The Chinese for bat (fu ?) sounds identical to the word for good fortune (fu ?) making bats popular in Chinese culture. Groups of five bats is said to be more powerful formula for abundance and fulfillment of dreams. Five bats together have long been used by Chinese artists to represent the five blessings: (wufu ?? ): long life, wealth, health, love of virtue and a peaceful death.